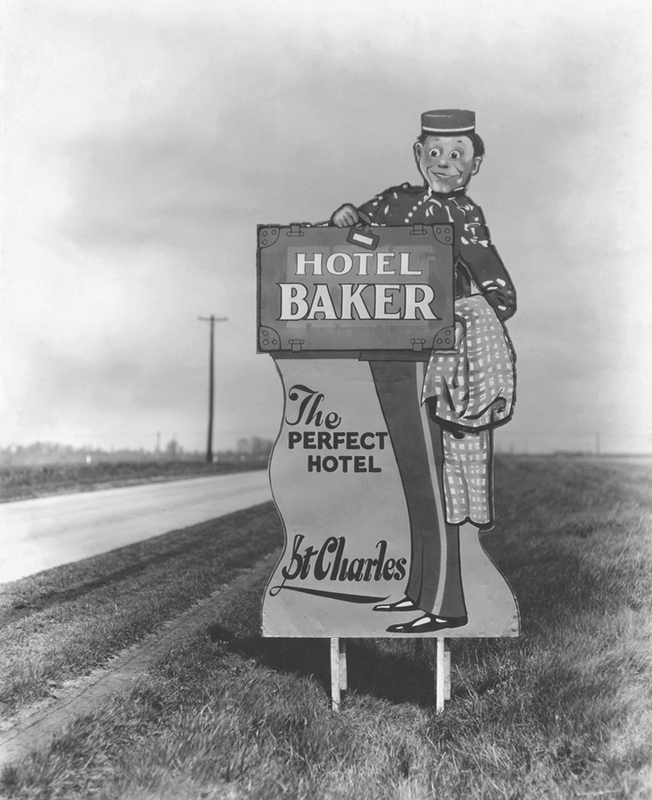 Since I was a kid, I've been fascinated with the Hotel Baker. When I got my first job there in 2009, it began a lifelong passion for the Hotel as I started to learn its history and about the people and the stories from this special place. I first saw the Hotel Baker Bellboy photo years ago and had wanted to draw it since then. When I finally got the photo, on the back of it was written that it was designed by John Davenport of Wheaton, Illinois. Bob Matson recalls the original sign was on Rt. 64, east of town, across the street from what is now Pheasant Run. Mr. Baker owned the farmland, and Pheasant Run was Airport Farm, named because Mr. Baker actually started the DuPage Airport because he let some fellows use his land to start up a small landing strip there, Mr. Baker would greet guests that would fly in there to stay at the Hotel. Airport Farm, the original barn still stands as part of Pheasant Run, was a dairy farm and Melvin Peterson and his family lived there. Mr. Peterson’s father Roy Peterson not only took care of Greyhound when he stayed at Red Gate Farm, but he was the gardener at the Hotel Baker. When the Hotel was a retirement home, the property was subdivided and sold, and the Hotel Baker Garage was torn down and replaced by Carroll Tower. Midwest Groundcover was given some of the terra cotta garage murals (which are on display at their location on Rt. 25) as part of a deal for taking care of the Hotel Baker Gardens. The original name “Hotel Baker Gardens” was lost to history when the retirement home replaced Roy Peterson’s annuals with rose bushes, and since, the Hotel Baker Gardens have been referred to as likened to the White House Rose Garden. Melvin & Ruth Peterson's wedding, Mr. Baker congratulating the newlyweds. In a sad twist of irony, before he passed away Mr. Baker sold Airport Farm and it was developed into the Pheasant Run Resort, which would eventually put Hotel Baker out of business. Melvin Peterson’s mom made Mr. Baker his last birthday cake, (quoting Mr. Peterson) “Mr. Baker loved a Sunshine Cake, she put a little farm thing on top, he didn’t want a party or anything.” His last trip out was two days after Christmas 1958 when he went to take a last look at Airport Farm before selling it. On that day he had been very chipper. After Mr. Baker was gone, his niece Dellora Norris was left with “that white elephant of a Hotel,” as she called it, she told him not to leave to her, but she ended up with because there was no one else with the money to operate it. Mr. Baker and Dellora Norris, standing, at Hotel Baker. The Hotel remained in business throughout the 60s and continued to be run by Bud Ziegler, who also managed Pheasant Run and became the Norris’s property manager as he was to Mr. Baker. R. D. “Bud” Ziegler had become the youngest Hotel manager in the country, and was talked about in magazines, when Mr. Baker made him the manager of the Hotel in the 40s. Bud initially started as a bellboy and became one of Mr. Baker’s closest friends.